Valdobbiadene is nestled in the steep foothills of the Dolomite Mountains, north of Venice, Italy about 50 miles. This town is reputed for producing the best Prosecco in the world for centuries. 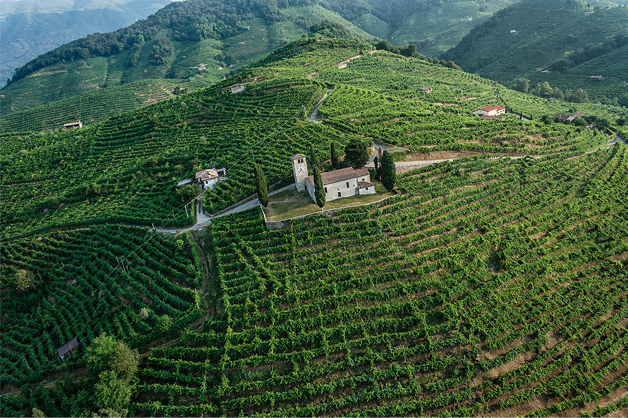 For a little background on Valdobbiadene, wine has been produced in these hills for over 2,000 years, and the Prosecco grape, Glera, has been produced here for over 1,000 years. What makes our terroir so special is the salty, calcareous (limestone) clay that lies right beneath our topsoil that gives our Glera grapes the coveted minerality and floral notes of our Prosecco. For the wine geeks in all of us, we will explain how the soil has this mythical salt concentration: The salty limestone clay of our vineyards was an ancient seabed raised up millions of years ago, and the salinity is replenished frequently due to our location: There is flat land between the steep hills of Valdobbiadene and the Adriatic Sea, so the rain clouds travel across the Adriatic Sea, collect salt from the sea, roll over the flat plains of the Veneto region and come to a stop at our steep vineyards in Valdobbiadene (that rise to between 525 and 1700ft above sea level), due to the high Dolomite Mountains right behind us (specifically, Monte Cesen at 5,300ft). In this way, the clouds often drop their first salt-laden rain on our vineyards. The Glera vines in our steep vineyards come from the oldest vine clones of Glera that we have found. These old clones produce a grape that is often smaller with thicker skin, and a looser grape cluster than other, newer clones, and these grapes have a higher complexity and a more pronounced taste than the grapes in other nearby towns. In Valdobbiadene, we are very nationalistic to our town, and we tend to keep our older vines and clones uniquely within Valdobbiadene. Our vines are all cared for by hand, lovingly, one by one, and in many cases for multiple generations. The average age of our vines new and old, is approximately 30 years, with some of the vines over 90 years in age. Cared for by hand is re-defined in our town of Valdobbiadene, because everything must be walked in and out by human hands, because our tractors cannot reach a large percentage of our rows of vines – our vineyards are not terraced so they are planted directly on the steep hills. Of note, we cannot terrace our vineyards, because the Glera vine enjoys a lot of water, but the roots of the vines cannot sit in stagnant water so we must promote the runoff leaving the vineyard slope as steep as possible. We test our grapes every 3 days leading up to harvest in mid September so we harvest our micro-plots on the exact day that there is the highest possible acidity and sugar in the grapes, allowing the freshest crisp taste, the most mineralty, and the most floral bouquet in our wines. In an industry where many vineyard owners use a “tutto fa peso” (everything makes weight) attitude of harvesting, where every grape is thrown into the bucket, whether it be dried up, rotten or moldy, we carefully select our grapes and grape clusters so our wines represent the best our vineyards have to offer. Our oenologists (winemakers) have generations of tradition in Prosecco winemaking and take the best advantage of newer, innovative techniques and tools to create our bright, complex wines that maintain a well-balanced, silky finesse to their finish. This is the part where we cannot tell you all of our secrets, but we can tell you that our wines take longer to make than other Proseccos and Sparkling Rosés of a similar nature, and that all of our wines are all-natural, sustainable and vegan with super low sulfites and sugar (this also means no headache or hangover!). Ours is a love of wine that stems from our passion for our vineyards and the grapes they produce, so we choose not to add extra sugars, sulfites and/or additives to our wines so that you can enjoy the purest flavors possible. With the goal of making the highest-possible quality wines, we needed to find a packaging that would show off our wine, so we went against the common trend of using dark bottles, and we chose clear glass to show off our wine. We also selected simple, elegant packaging that would set our products apart from the rest of the Champagne look-alike bottles with the idea that we do not make Champagne, we make Prosecco, a wine that has been around since 200BC! Altaneve means “high snow” and it pays tribute to the snow-capped Dolomites that you can see above our vineyards. That is also why our logo is a snowflake made up of the letter ‘A’ and our foils are white (recalling the snow capped mountains). Why are our wines special? The truth is in the bottle, so we invite you to enjoy a glass of Altaneve!